If you know me, you know I love Majora's Mask. Though it's not my favorite Zelda game, it's up there. 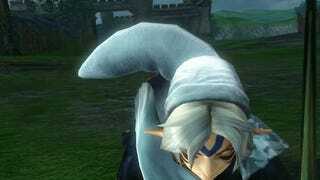 That's due in no small part to the presence of the Fierce Deity Mask. I have the DLC pack now, so without further ado, here's a closer look. When shots first surfaced of my favorite Link in Hyrule Warriors, I knew I'd have to boot up the game on day one to check this out. The DLC released in Japan on 1/29, which was technically yesterday for those of us in the states. I haven't had much time with the new update yet, so I'll just tell you what I know. Fierce Deity Link (Oni Link if you're hip) isn't the form you take all the time. You'll start off as kid Link with the Keaton mask on the side of your cap, and the Fierce Deity mask strapped to your hip. While in kid form you can also play the ocarina, which will trade your super meter in for magic. When you do your super move as kid link, he'll briefly don the Fierce Deity Mask for a spin attack, similar to adult Link's. Once you fill the magic meter, things get really fun. Once you're transformed you can pull all of kid Link's regular moves off as Fierce Deity Link. They're faster, much more powerful, and have a bit of extra flair. Of course, being in this state drains your magic meter pretty quickly, but each kill replenishes that meter a bit, meaning you can possibly stay transformed indefinitely. So far, the new update seems pretty solid. Kid Link is an absolute blast to play as. The new Termina map in Adventure mode seems interesting. It employs a time-based system that I haven't taken the time to figure out yet, but there are even owl statues! 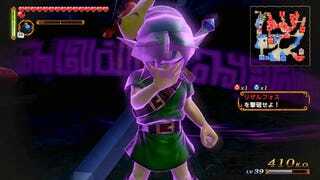 I haven't checked out Tingle yet, but I'm sure I'll make my way to him soon, and when I do I'll share my impressions here. Have any questions about the update? Let me know in the comments.